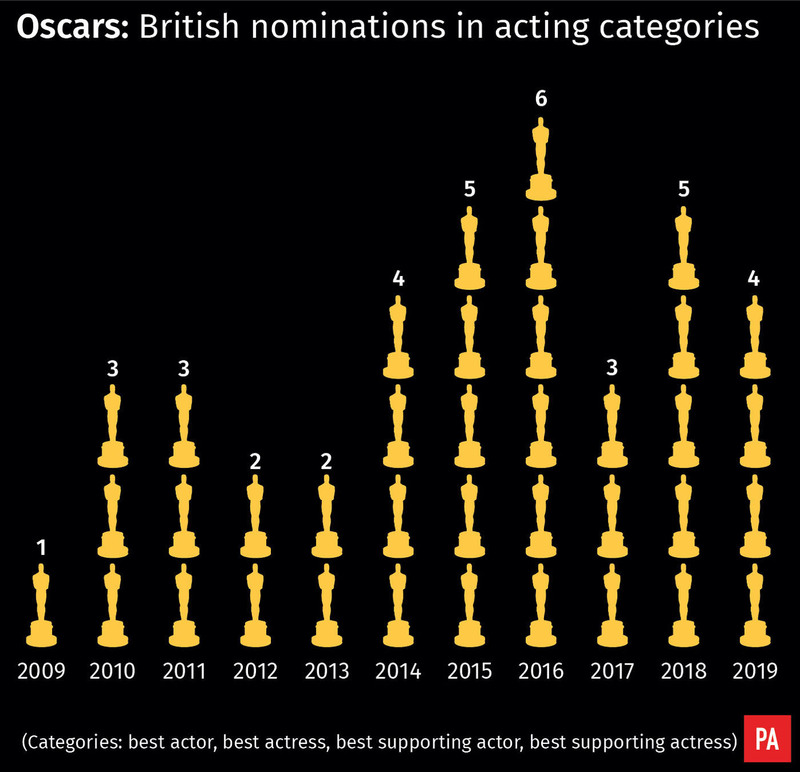 Britain notched up six wins at last year’s Oscars and there is plenty of opportunity for an even better performance this year. There are British nominees in all four of the acting categories: Christian Bale for best actor in Vice, Olivia Colman for best actress in The Favourite, Richard E Grant for best supporting actor in Can You Ever Forgive Me? and Rachel Weisz for best supporting actress in The Favourite. Colman could be in with the best chance of success having already won trophies at this year’s Golden Globes and Baftas. 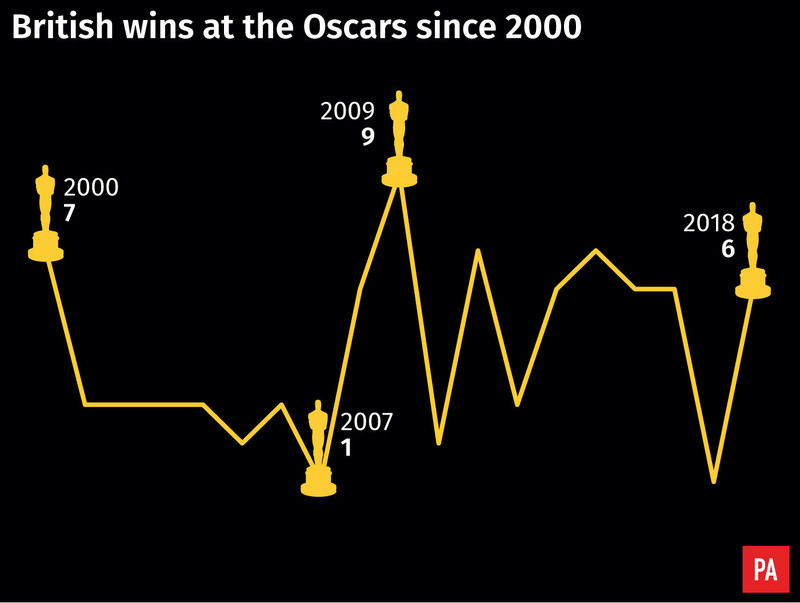 Were Britain to come away empty-handed from the acting categories, trophies could still be picked up elsewhere. Three of the five nominees for best costume design are British: Alexandra Byrne for Mary Queen of Scots and Sandy Powell for both The Favourite and Mary Poppins Returns. Make-up artist Jenny Shircore shares a nomination for her work on Mary Queen of Scots, while Deborah Davis is jointly nominated for co-writing the original screenplay for The Favourite. Two British designers share separate nominations: Alice Felton for The Favourite and Nathan Crowley for First Man. In the best original song category, writer and producer Mark Ronson shares a nomination with three others – including Lady Gaga – for the song Shallow from A Star is Born. British sound editors John Warhurst and Nina Hartstone get a nod for their work on Bohemian Rhapsody, as do sound mixers Paul Massey and Tim Cavagin. 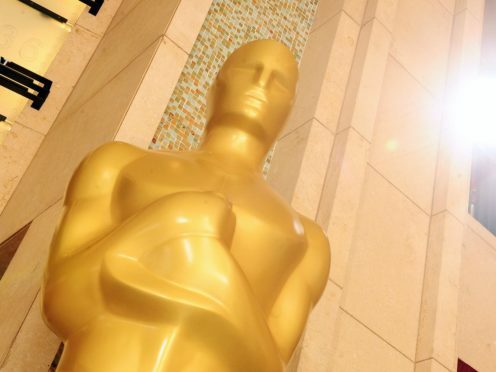 Bohemian Rhapsody, a joint UK-US production, also gets a nod for best film, as does The Favourite, a co-production between the UK, Ireland and the US. British animator Alison Snowden is one of the people behind Animal Behaviour, which has a nomination for best animated short film. UK talent is also recognised in no fewer than four of the five films nominated for best visual effects: Christopher Robin, First Man, Ready Player One and Solo: A Star Wars Story.